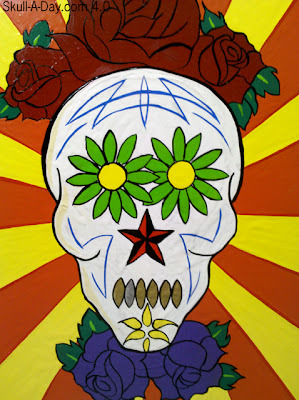 Micah Vogel sent us this sugar skull that he painted recently. He explains it's done with "one shot enamel on PVC". I love sugar skulls. This one is different than the traditional ones, which is nice. I like the pinstriping, like in his previously submitted piece. I like the design of the roses and placement. I like the traditional element of the flower petals around the eyes and at the chin, mixed with nautical star for the nose and metallic teeth. The radiating background, really makes the white of the skull pop out more. I'm not familiar with using enamel on PVC. I'm familiar with PVC fabric, vs the hard plastic, so my curiosity has been sparked as to what paint will adhere to the fabric. As winter is hopefully winding down this next month for us in the Northern Hemisphere, today’s simulacra remind us that sometimes the cold times can bring us amazing finds. Sally Van Eycke told us: “Coming out of a sports supply store in Columbus, Ohio. 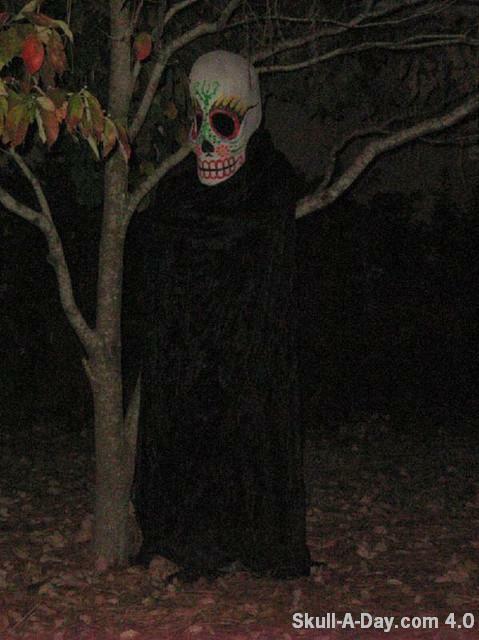 They kind of also look like tree spirits from Princess Mononoke. It was winter not like any winter of the last few years when the cold was starting to get to me that I wax prosetic. As we travel the highway, sit for a spell, or take great joy in watching the cold become a memory and you go forth and share these submissions... tell them Large C sent ya! Thank you all for the wonderful submission! 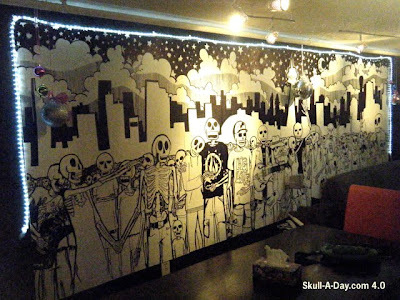 If you know where Plymouth, U.K. is then you know where to find Sophie Adamson who submitted these keen skull sketches. As the "Tatman" of the Skull-A-Day editing crew I feel partially qualified to say that these would probably make great tattoos. Even if they don't become body art they're still great drawings. I just can't help but picture the skull with snakes tattooed across the chest of some guy named "Snake". Check out Sophie's deviantart page for more sweet sketches. Thanks, Sophie! Teresa in Minneapolis wrote: “I found your site through an old classmate of mine and friend of yours, Paul Overton. Welcome to another addition of Flashback Friday. 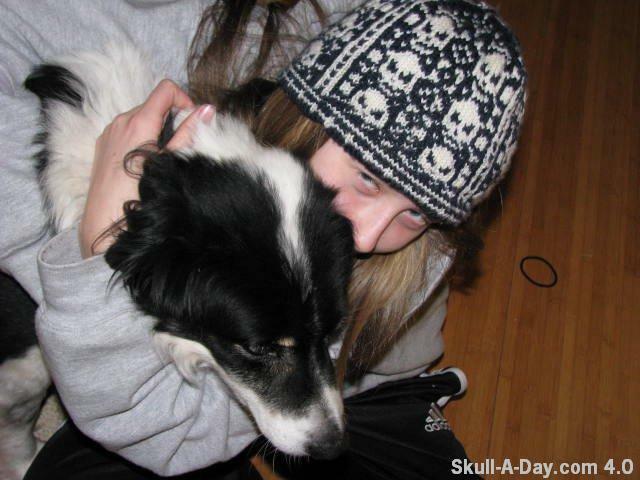 ** This year the guest editors, Citizen Agent, Azurafae, and myself, Tatman, are taking turns counting down our personal favorite 17 skulls from the Original 365.25 Year. So please join us as we visit the archives and add our additional commentary on some of the original pieces. 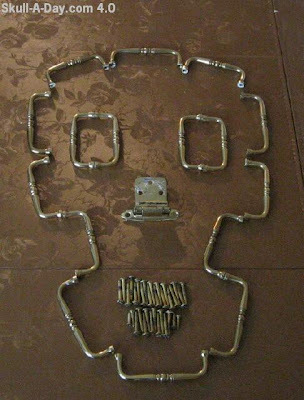 I discovered Terry Border's Bent Objects blog around the same time that Skull-A-Day entered my life so I always relate the two together. It seems that the two blogs have a lot of overlapping fans. 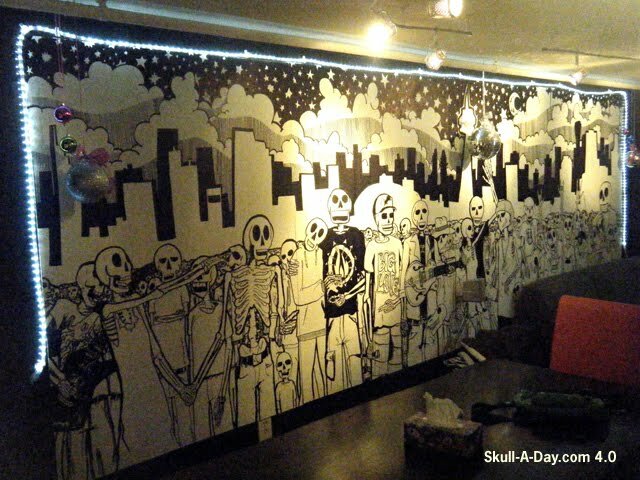 We all love Terry's art here at Skull-A-Day so you can imagine my extreme pleasure the day that Noah posted this beauty. 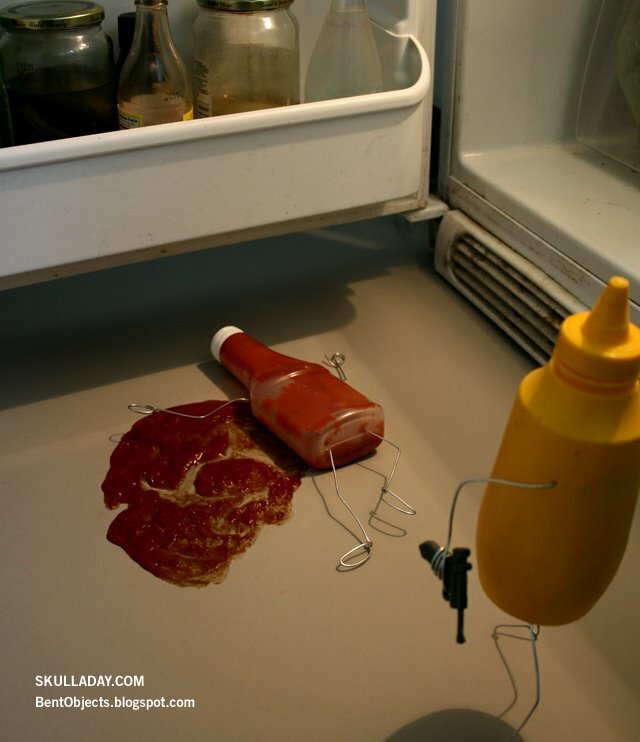 Like a tale straight from the mind of Scorsese, Mustard has had enough of Ketchup's popularity and the unwanted attention from the fast food moguls is enough to make the condiment family pull the plug on the pretty boy of the bunch. No more late night dips with the French fries, no more cameo appearances in the fancy sauces that he loved to lavish in. 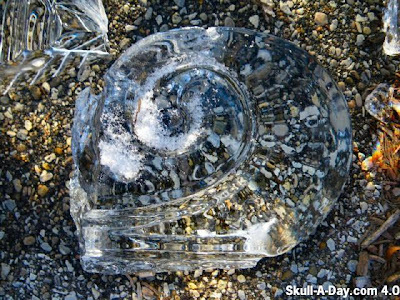 Terry's ingenuity in making everyday objects come to life is a strong rival to the Skull Master's ability to create skulls out of just about anything. Like two powerful minds melding from different points of the spectrum, the Bent Objects Skull brings out the best in blog creativity. 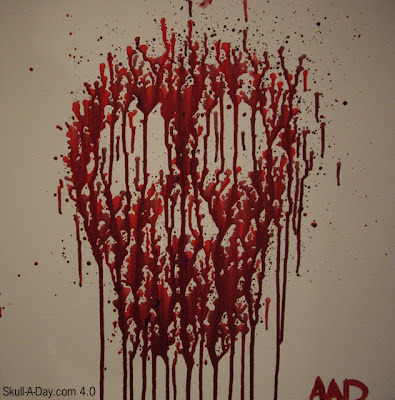 Plus, a skull painted in ketchup is just the right color for the gruesome bloodiness that most people expect in skull artworks so you know it's a winner. 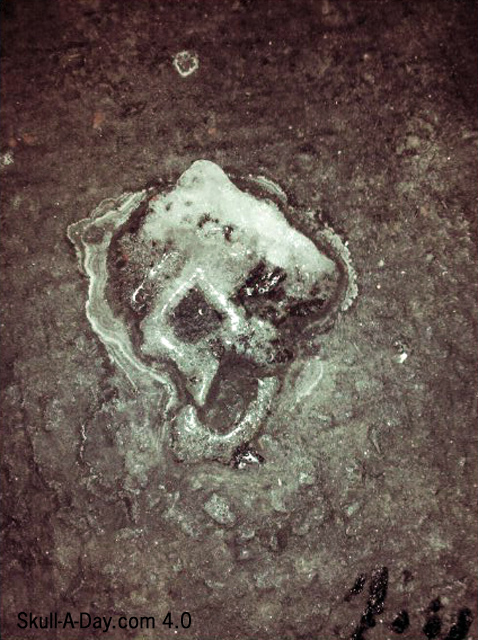 Be sure to check out the original post for a close up detail shot of the actual ketchup skull here. A new version of my United Skull of America II will be on display at Main Art's outdoor X Gallery March 4th – April 22. 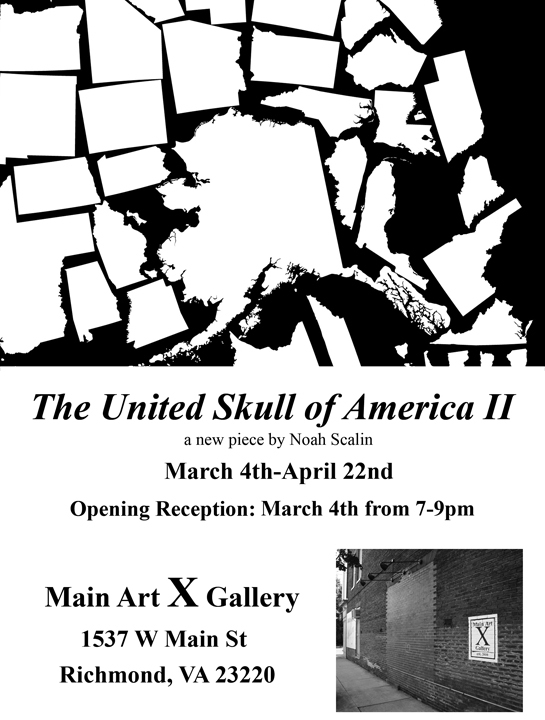 If you're in the Richmond, VA area I hope you'll swing by the reception from 7-9pm on March 4th. Melanie sent us six skull blocks that she made. I like that each block is different. I'm hoping to put some of them in different quilts. So far, total, we have enough for 2 quilts. Again, I would love to see more blocks, so keep sending them in. The more blocks we have, the more quilts I can make to auction off and the more funds we can get to donate to Becky's Fund. The quilt blocks need to be 12"x12" in total size. This includes 1" around all sides of seam and ironing allowance. This means you have about 10"x10" of art space. 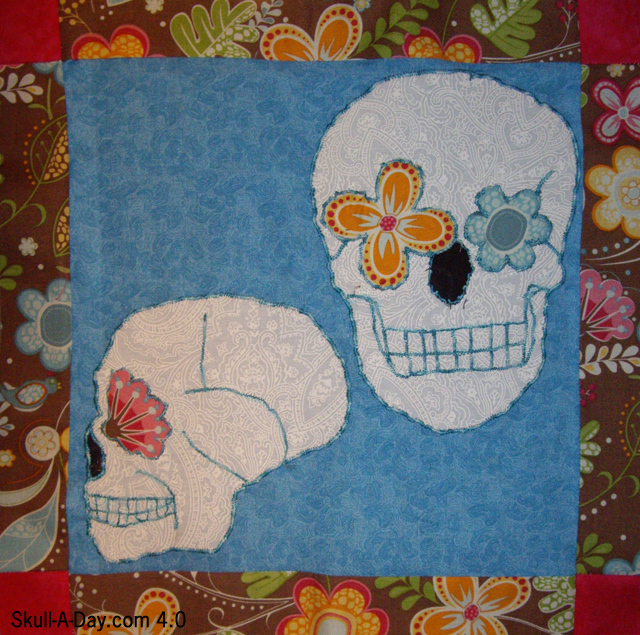 Since these are art quilts, feel free to use any medium you wish that will adhere to a 12"x12" cotton square. Need inspiration, check our other submissions. Your email...so I can tell you when yours arrives. 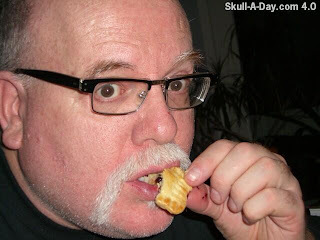 The deadline for us to receive the skull blocks is Saturday, May 28, 2011. 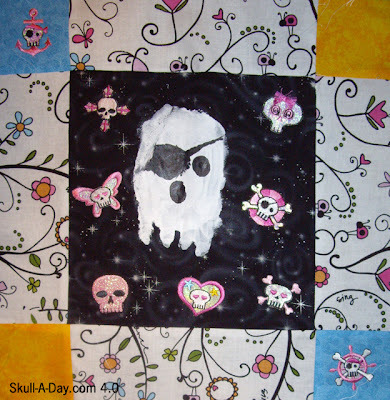 This is so we can sew the quilts in time Skull Appreciation Day. The quilts will be auctioned off after the June 4th event. Some might be auctioned at the event...more on that when I have more details for you. 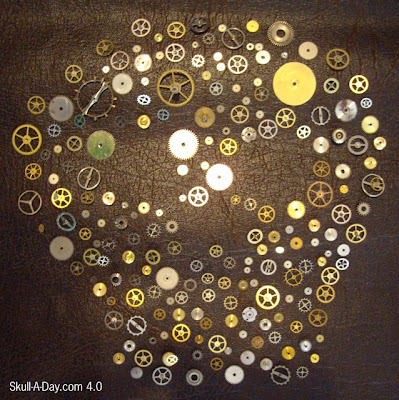 This skull is inspired by Steampunk and clock making. I had bought these tiny watch parts to make jewelry and accessories with. I had a brown piece of thin faux leather. I though pairing the two would work well for a Steampunk influenced piece. I've loved Victorian and Sci-Fi since I was a child, which are two components in the Steampunk genre. I love the morbid and proper aesthetic of Victorian. The allure is in the mystery of a person. This plays into Sci-Fi (Science Fiction) well. My mom introduced me into this world of curiosity and wonder at a young age. I appreciate that every day. As far as clock work goes, well the cogs are from watches. I love that something so important can be made of tiny fragile parts. To give you a sense of scale, the largest cog (gold, top right) is about the size of a US nickel. Not only are they fragile due to size, but they are thin, have serrated edges and are sharp. I love something that is deadly and beautiful. 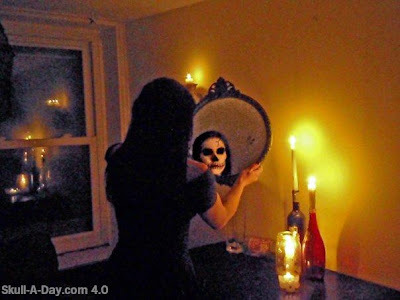 Every week in the 4.0 year, I will post my own Dia de la Abby posts as well as a tutorial with instructions on how I made my piece. Hopefully you feel inspired by my posts just as I was by Noah's Skull-A-Day 1.0 daily project. Need more of me than just a weekly dose, follow me on Facebook. 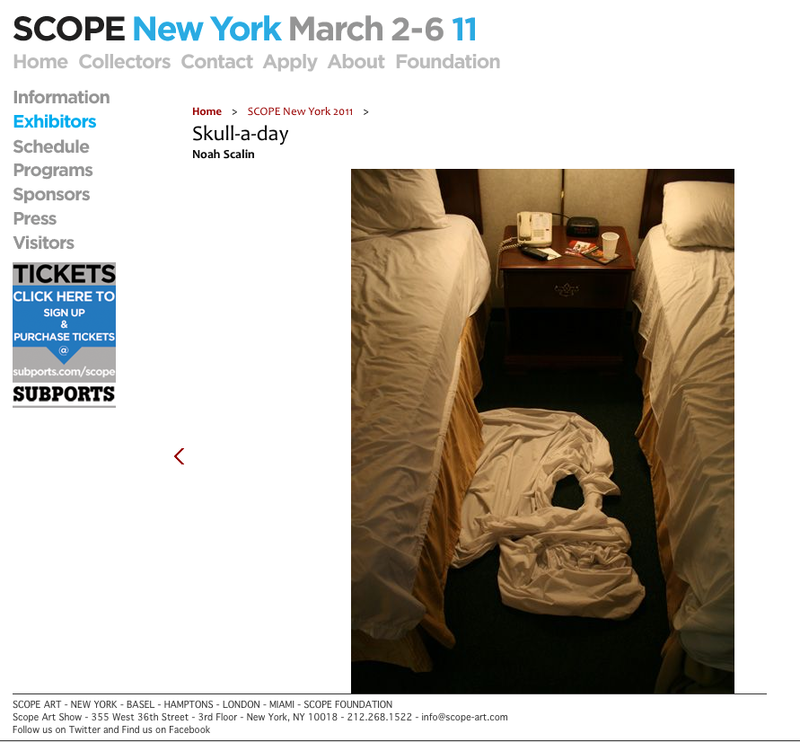 Several of my pieces will be on display at next week's SCOPE Art Show in NYC! If you stop by, you will get a small preview of the show I will be having this November at Krause Gallery, which is representing me up there. The details can be found HERE. Rachel Salavon from Dallas, TX, sent us this creation. 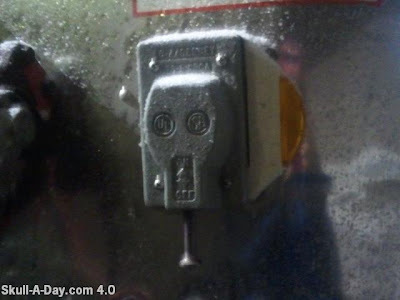 I love that it's a skull on a skull. It's a very creative use of "canvas". 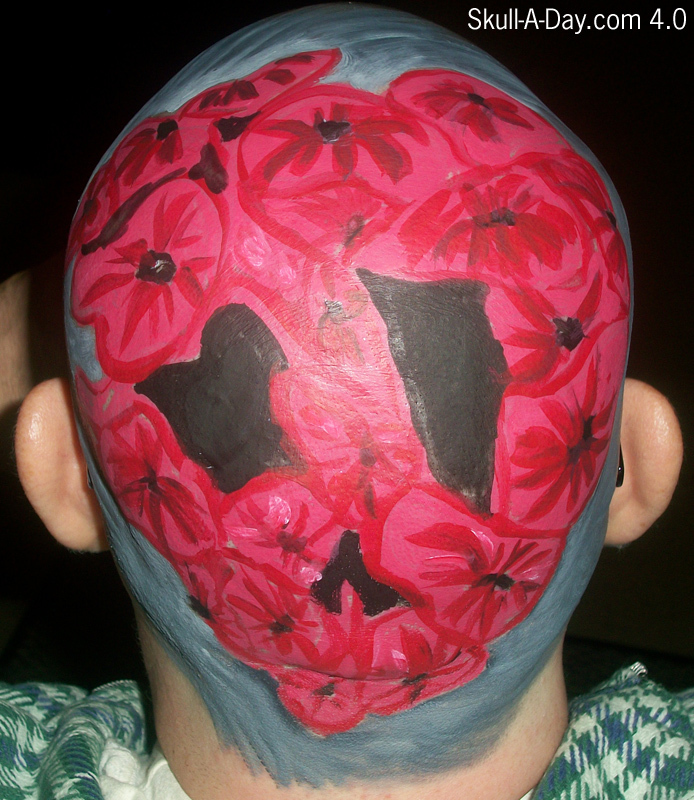 The flowers remind me of Noah's Flower Skull 2. I like the two colors of red that were used to make the petals of these stylized flowers. The placement of the flowers is very organic. Overall, it's a really neat piece. 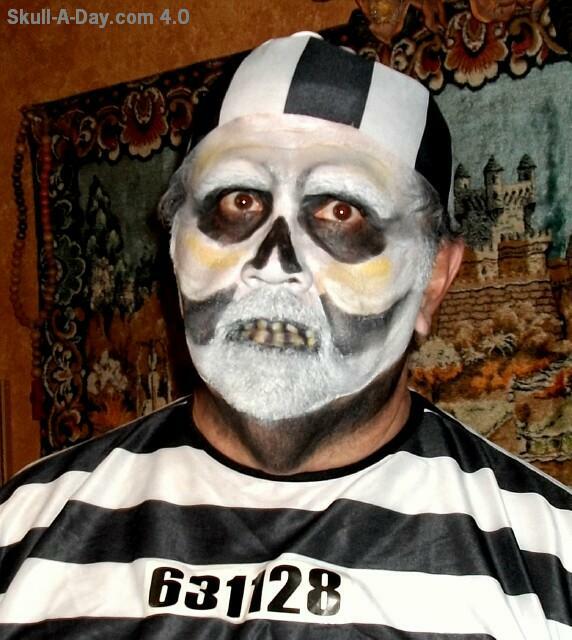 Body paint (of in this case, skull paint) always intrigues me. Since the work is done on a person, you have to be consensus of the 3D form, how the skin shifts and the position the person will be when you are done. The only work I've ever done in the realm of body paint, is full face paint. I know that takes a long time to do, so I imagine this would too. This is a great collection of items that you have for us. 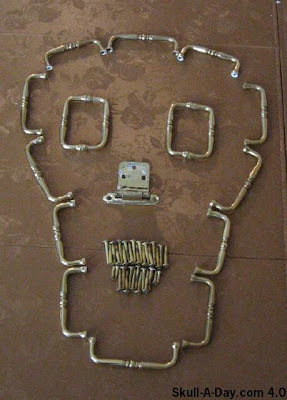 I am always fond of found items that get re-purposed into art as well as art created by the waste left behind from larger projects. 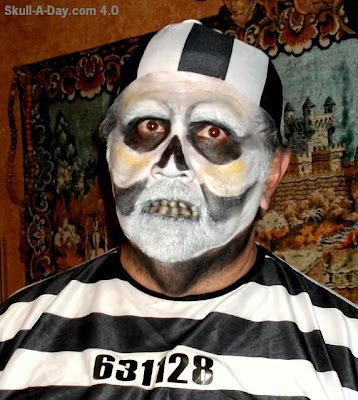 The photo of you in makeup is wonderful in the way that it was staged giving the sense that we have surprised you at a time before you had a chance to “put your face on”. 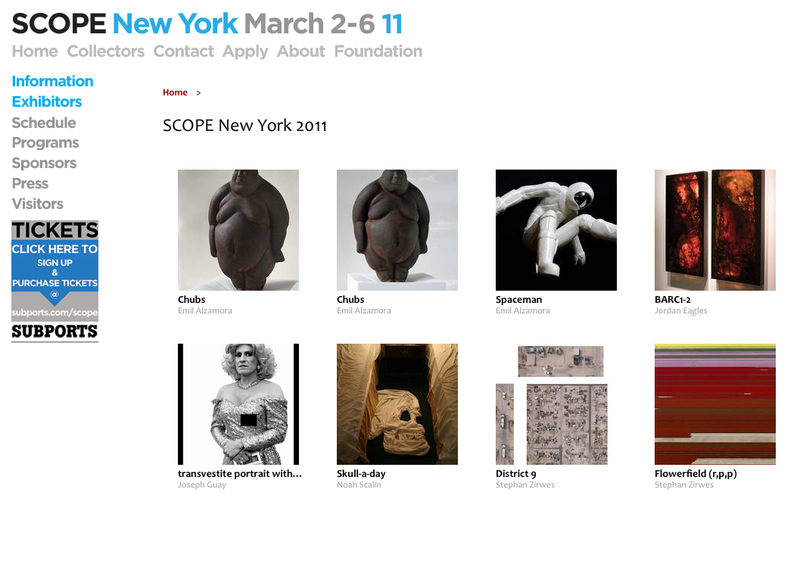 Thank you for submitting your work for us to share and be inspired by. Rikki Traina is a Daily 365 disciple who crosses over on this painting of hers featuring a skull with an incredibly close cut. It's so cool seeing all of the people that Noah has inspired into their own 365 projects. 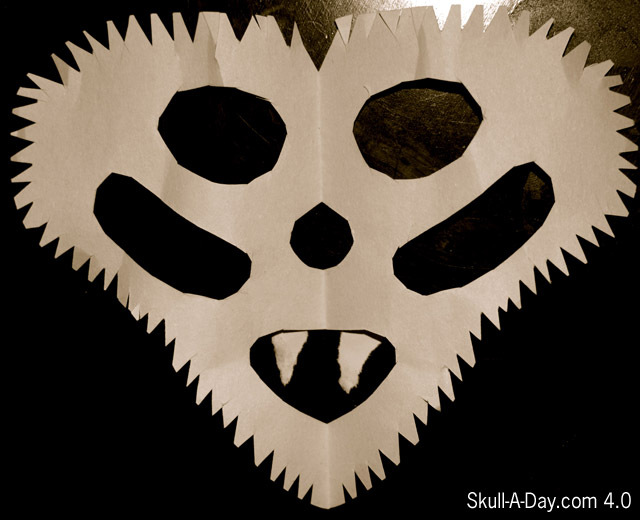 I would have a hard time thinking that anyone could get creative with scissors everyday, but Rikki does a great job. I have a feeling that her work might have a few more skulls involved before the year is up. Thanks for keeping us in the fold, Rikki! Sarah Yakawonis, Portland Maine submitted this quilled skull she made. 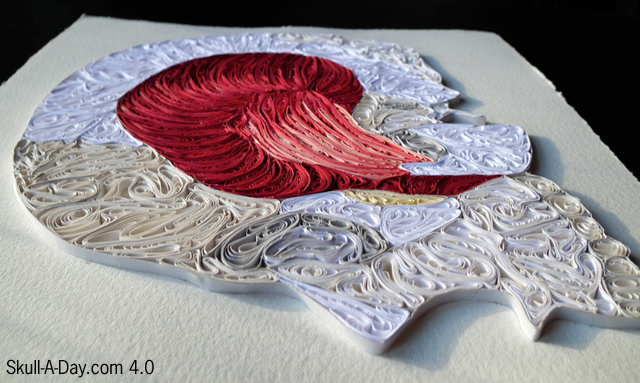 If you are not familiar with the art of quilling, don't worry, it's an uncommon art form. Basically, strips of paper are rolled, shaped and glued together to form a filigree type design. In this case, red has been used to form a brain and white to form the bone of the skull. 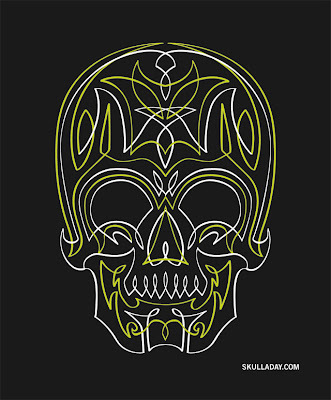 I love the use of the rolled and pinched shapes to form the graceful curves of the skull. This piece and Noah's 312. 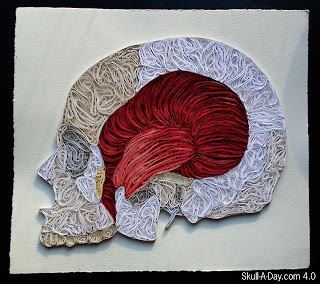 Quilled Skull make me want to try doing this. p.s. Be sure to check out Elena's recent lovely recent quilled piece as well! With winter fading fast, I thought I should share these wintry skulls. 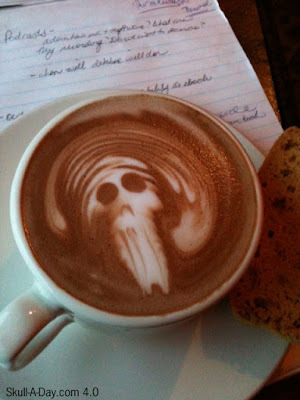 Bess Lovejoy from Seattle says, "I just ordered a hot chocolate at a Fremont Coffee in Seattle, and they gave me a beautiful skull decoration made out of foam! I was was so pleased I had to take a photo of it and send to you guys (see attached). Very silly, but very fun. Also, it's delicious." Jamie Slade from NYC, sent us this ice blob she found on her drive way. Mike McGary from Dallas, TX sent us this grill skull. 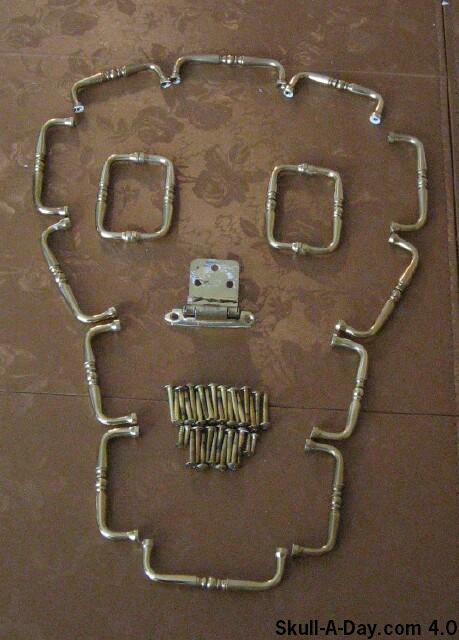 When Brock Essick of Winchester, Ca sent us this he simply wrote, "I made this. I like the site and thought it would be fitting." A truer statement would be hard to find. I think it might have been Einstein who believed that if we were to use 100% of our brain's capacity then we would cease to have physical form and would only be balls of light. 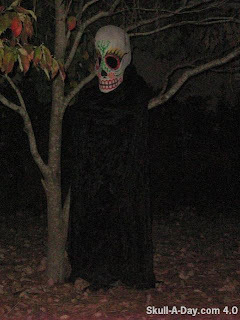 This skull gives me the feeling that the light is the energy leaving the body. The stars shine brightly as the energy leaves this world into another astrological plane. Great work on this glowing piece, Brock! To me, pinstriping is a truly underrated art skill. I know that Noah created this pinstripe skull digitally, but that is only because of the time and patience that the painter must have in order to acheive near perfection. The ability to maintain such crisp detail, and to create a portrait with mere single wide brush strokes amazes me. I'd love to be able to learn this skill myself, but more than likely I'll just hire someone with experience to apply this pinstripe skull to some kind of future ride of mine. Maybe the gas tank of some kind of 2 wheeled vehicle...perhaps. 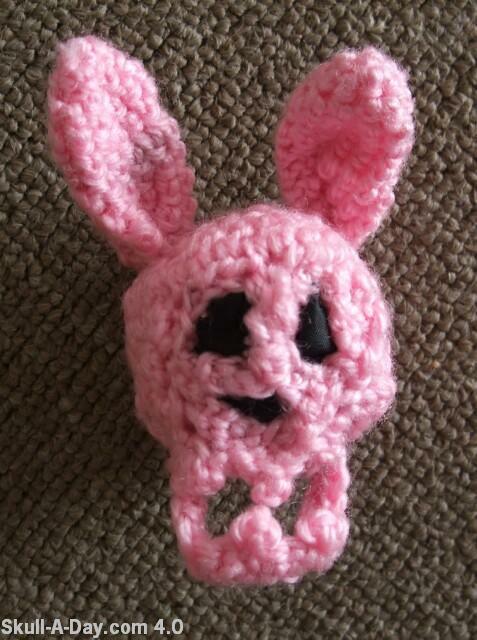 A Rabbit A Day creator, Sarah from Ilfracombe, North Devon, England sent us this rabbit skull for our quilt project. Sarah made a rabbit template. She used the the template to cut rabbits out of fusible webbing backed fabric. She arranged the rabbits and ironed them into place on an Alexander Henry skull and lace print cotton fabric. After, she stitched around each rabbit, overlapping her stitch lines, so the rabbit shapes were maintained. 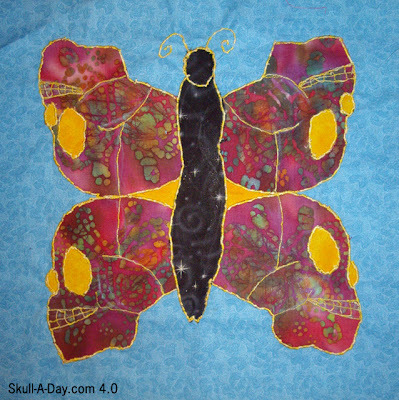 This is a nice way to do applique. 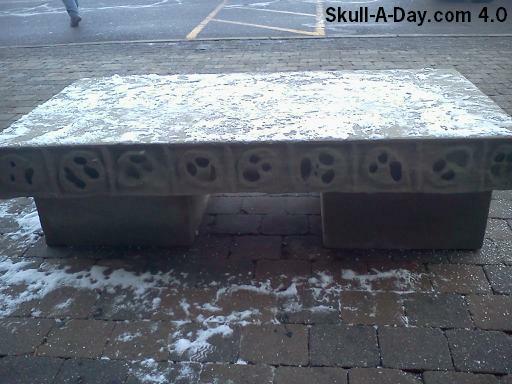 I love the repetition of the rabbit shape and how it's arranged to form a skull. This is another great example of a creative way to make a skull quilt square. We've been getting a lot of blocks for our Skull-A-Day and Becky's Fund Skull Quilt Project. We have enough to make about 2 art quilts, but we definitely want more blocks. The more blocks, the more quilts we can make and auction off. The proceeds from the auctions will go to Becky's Fund, which is an organization that helps victims of domestic violence. The quilt blocks need to be 12"x12" in total size. This includes 1" around all sides of seam and ironing allowance. This means you have about 10"x10" of art space. 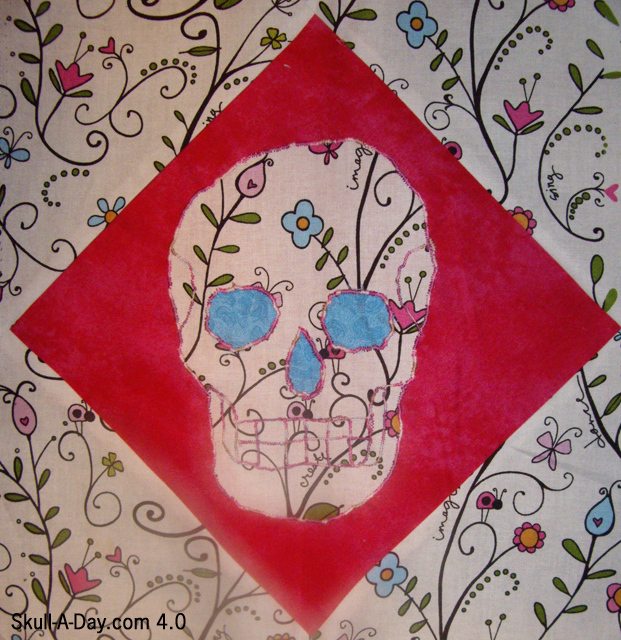 Since these are art quilts, feel free to use any medium you wish that will adhere to a 12"x12" cotton square. 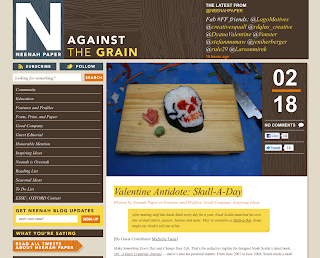 Need inspiration, check our other submissions. 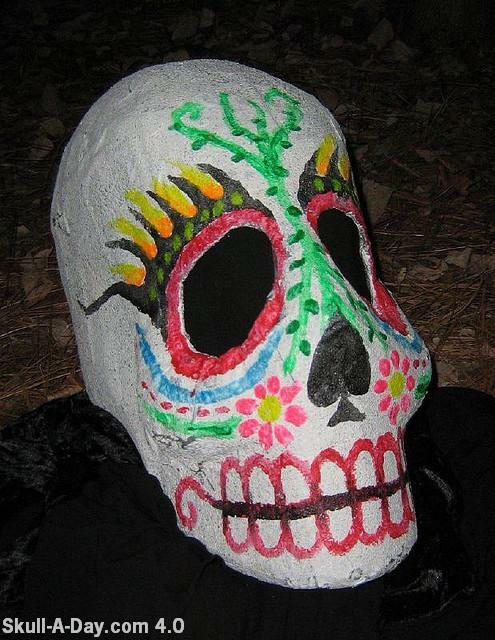 The deadline for us to receive the skull blocks is Saturday, May 28, 2011. 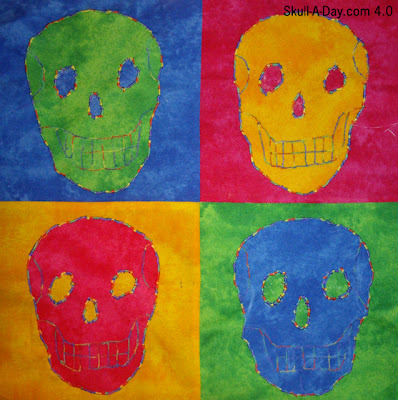 This is so we can sew the quilts in time Skull Appreciation Day. The quilts will be auctioned off after the event. Some might be auctioned at the event...more on that when I have more details for you. 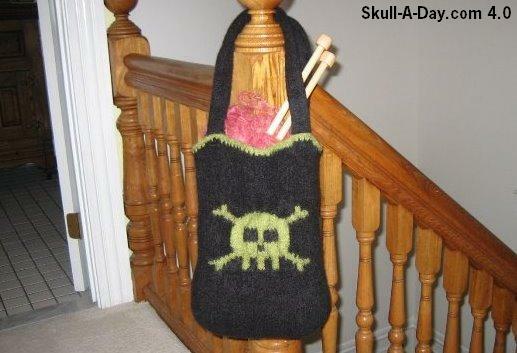 One of the truly amazing things about fiber arts is the fact that you can make functional items for everyday use. There is something amazing about a stranger walking up to you and giving you a compliment on something you made. Today allow me to be that stanger and tell you all that your work is amazing. 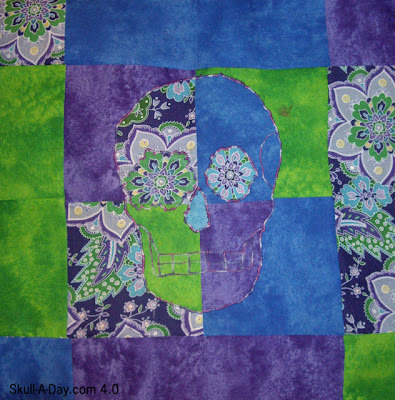 Thank you for sharing your artwork with us and since you are all so talented let me invite you to participate in the Skull-A-Day quilt project that is being done in conjunction with Skull Appreciation Day on June 4th. I have been playing with blood splatter on a few hair accessories, but I wanted to try it on canvas. 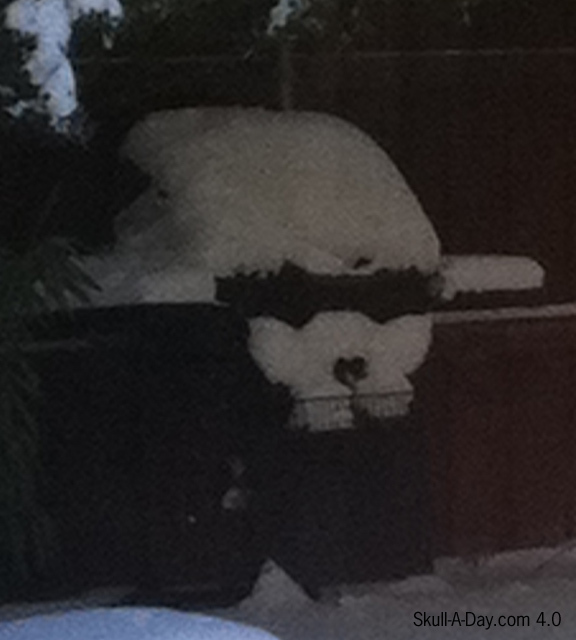 I recommend doing this outside, as it's messy. Also, cover your work surface or you will have splatter where you don't want it. I laid the canvas flat. I used different shades of red paint (red + black in different amounts) with water to make the paint splatter better. I used a paint brush because I wanted large splatters and drips. I tapped the handle of the brush on the side of one pointer finger to control the splatter mess. If you wanted something finer, you could use an old paint brush and rub your thumb across the paint dipped bristles. I made sure the shades of red splatter overlapped each other, for added interest. After I was satisfied with the coverage and used up all my alloted paint, I stood the canvas up and leaned it against the railing of my balcony. The paint immediately ran and a large pool of it formed at the bottom...sticky much like real blood. After the paint had stopped running, I laid it down to dry, away from the pool of paint on the covered work surface. This is definitely one of the creepier paintings I've done, but the way the reds flow together, is really beautiful. 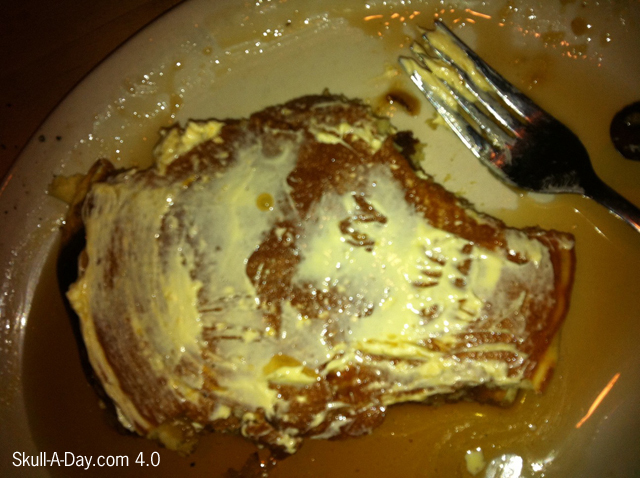 Lesli Marshall sent us this "pancake syrup and butter skull made at Kerbey Lane Cafe, Austin, Texas." It's breakfast time, so I thought this was appropriate. 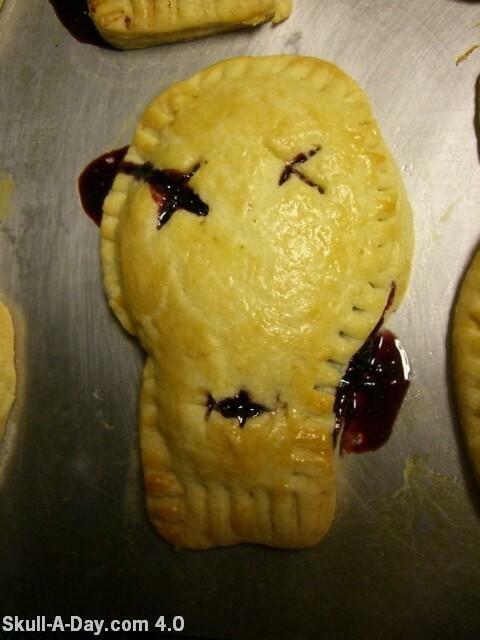 I love playing with my food and making skulls out of it at restaurants. Breakfast is a especially good time to do so. Pancakes are great because they can come with toppings like butter, syrup, berries, compote, Nutella, chocolate chips...etc. Skulls are a good motif because it creeps out or entertains the server...or if you made your own breakfast...yourself. Great now I want pancakes. Where's a Sunday brunch time travel device when I need it? 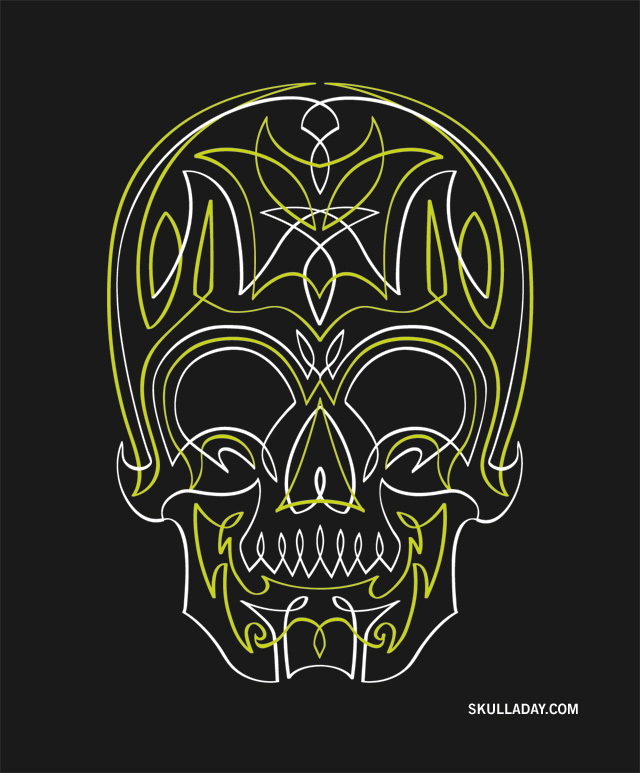 Today’s Skulls are all about our readers embracing their inner skulls. 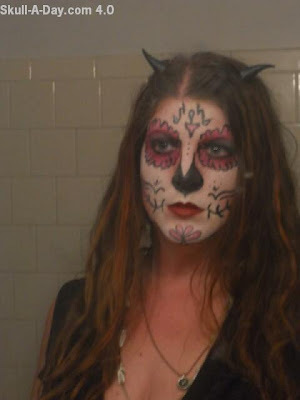 Last today is Nicole in Charlottesville,VA who showed us her dia de los muertos makeup from last Halloween. I really enjoy being able to share the faces of those otherwise faceless people we interact with us everyday either through comments or “likes”. Thank you all for taking the time to submit your inspirations and allowing us to share them with others. It is through your hard work that the site continues to still be going strong. Axl Rose once requested that someone take him down to some kind of paradise city, but if I were him I'd be asking for a ride to "Skull City". 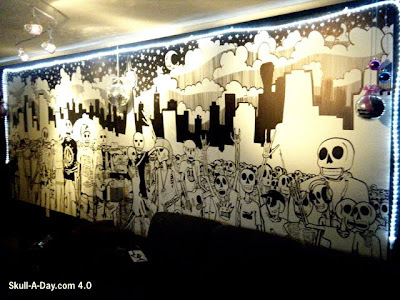 This mural exudes the revelry of undead skulls. 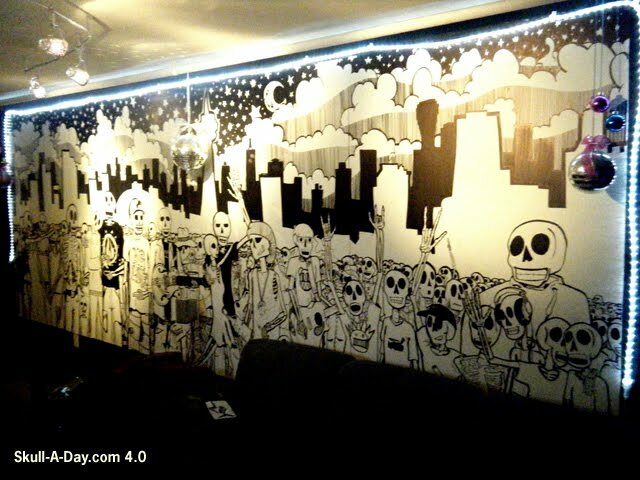 It's over the top size lets you know that these skulls came to PARTY!!! Thanks for inviting us to join, Ben. 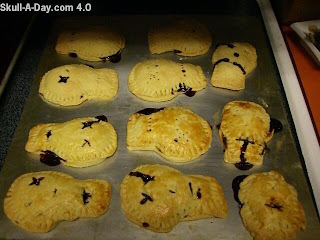 With today being St. Valentine’s Day I thought it would be appropriate to share some excellent hearts tarts with our readers. 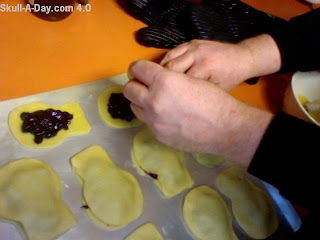 I really like the supporting pictures you sent along of your creation process. It was really interesting to see the diversity of how they turned out and what it took to get that “one good one” but then again they all were good ones in a different way I bet. 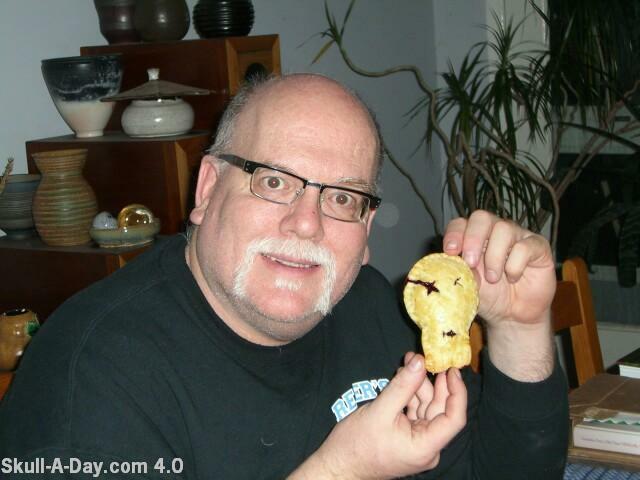 Thank you for the excellent submission and for being a loyal reader/supporter of the project. 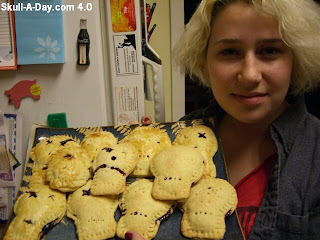 We look forward to seeing some more of your baked skulliness in the future. Amy Whitehurst of Snow Globe 365, sent us this piece. 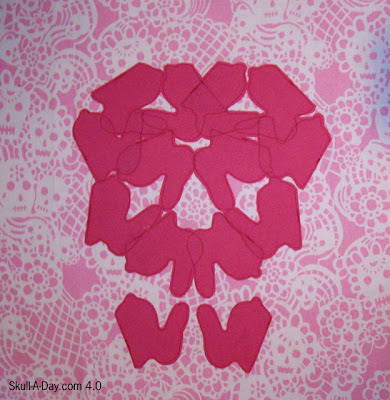 "I realized skulls are on the brain when I sat at the Children's Museum art table with my daughter making paper snowflakes and created this." Amy takes daily photographs with her snow globe collection. This snowflake skull is a good mash-up of her project and ours. I also tend to make skulls at the Children's Museum of Richmond, though lately I've been making lots of flowers out of their large variety of weird supplies. Besides being a skull and a snowflake, it's also heart shaped, which is good for Valentine's Day, today. Happy Valentine's Day all!